Observer has obtained previously unseen plans for the new Union Court. Union Court at present was not exactly planned. It was originally the carpark for Chifley Library, but over the years was repurposed as ANU’s prime student space. So it’s no surprise there’s a lot of issues with the current site. Student services like student central, the Academic Skills and Learning Centre, and Access and Inclusion are spread over 13 different sites across and even outside of campus. 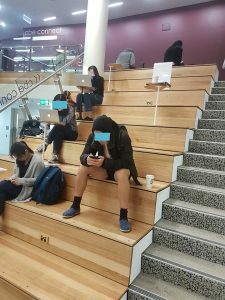 Chifley Library is “bursting at the seams”, according to Deputy Vice Chancellor (Academic) Marnie Hughes Warrington, and the university desperately needs more teaching and learning spaces, both formal and informal. The Union Court redevelopment intends to fix these issues, at a price tag of $220 million. Clubs and businesses in the current Union Court have been told to vacate their spaces over the coming weeks. The Arts Centre will start closing off by June 6, and the bar will hold its last night June 17. Demolition will begin shortly afterwards from July, with construction expected to continue untill late 2018. 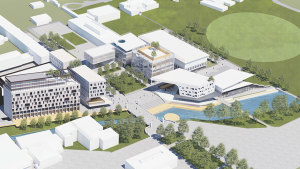 The new buildings and services are planned to be open by the beginning of Semester 1 2019. This is only Stage 1 of the redevelopment. 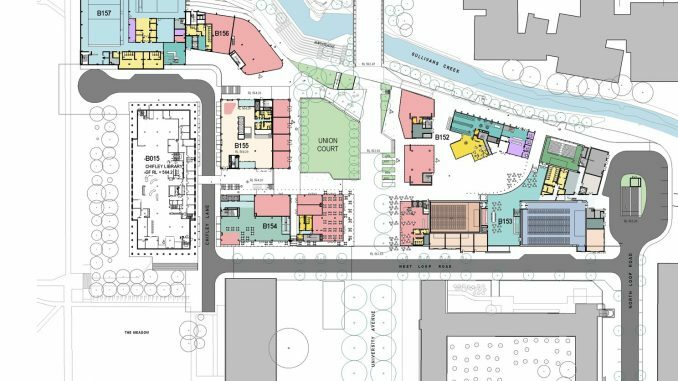 ANU has not commented recently on what Stage 2 might involve, or if it will happen, but initial plans included demolishing the ANU gym and redeveloping the Copland precinct, to add more student accommodation and improved classrooms. That was the deal in late 2015 – since then, budgets and plans have changed. We don’t know if there even will be a Stage 2, and comments from those involved suggest it may be contingent on the success of Stage 1. However, the construction of a new Gym suggests that at the very least ANU plans to repurpose the existing gym building in some way. “If we can get Stage 1 done and people are impressed with that, we can get investment for the rest of the plan,” says Hughes-Warrington. So what’s the current redevelopment going to look like? Here are some key points. 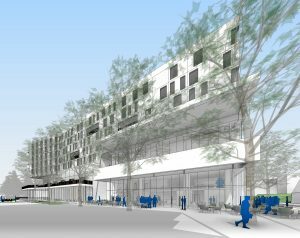 Two new student accommodation buildings will be constructed where the ANU Union building presently stands. The current plan is to move Fenner Hall into these buildings, when they leave their current location in 2019. The student body is keen to keep the existing Fenner management and administration, but this may not be possible. Speaking to the Observer earlier this year, FRC President Victoria Xia said it was an issue she would raise and fight for, but that “if they think it’ll be cheaper to go with UniLodge … it’s probably not something we’ll have a say in.” It still remains possible that Fenner may not move into these buildings. If Unilodge does take over administration of the new buildings, Fenner residents may have cause for concern. After Unilodge assumed administrative oversight and maintenance of the interim Bruce Hall, some Bruce residents have expressed serious concerns about the new administration, including higher fees, charges for laundry and issues with payment processing. Xia believed that a rent increase will be “unfortunately unavoidable”. 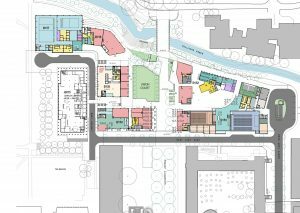 The ANU says that “if the decision is made to go ahead with Fenner moving to Union Court, Fenner residents will be involved in the design process for the new Hall”. There’s a range of performance options in the Redevelopment. Things look great for live music, but possibly not so good for theatre and dramatic productions. What’s with the outdoor amphitheatre? The amphitheatre is being placed across Sullivan’s Creek. Yes, across. Seating will be on the Union Court side of the creek, next to the new gym and pool where the Arts Centre currently stands, and a stage will be set into the western bank. Some noise concerns have been raised over the amphitheatre as a venue for live music, given the student residences are close by. The amphitheatre will not be the main late-night live music venue in Union Court. Redevelopment officials have said it’s intended for daytime events and more casual music performances, like the kind given in the Union Court amphitheatre currently. Given the outdoor nature of the venue, it’ll probably be wise to check Is It Cold In Canberra before heading for a show. The “cultural centre” of the redevelopment will house three large performance venues for live music, events, cinema and theatre. The venues sit around a central commons area, including a bar, and food area also hosting a stage. They will be soundproofed, according to a redevelopment planner, and will be right next door to the new hall of residence. Each has a specific purpose: The largest, a 500 seat space with a large stage, has been flagged for major events, which will likely include many live concerts. This one has retractable seating, to allow for an open-floor space for a rowdier concert, or tiered seating for a more chill event. There’s a 300 seater which includes a full-size cinema screen, the administration’s gift to ANU Film Club. Finally, a 150 seat venue has been flagged as the “Drama theatre”. However, judging by the plans, the venue does not have a backstage area, or any kind of proscenium arch, just a raised stage at the front of the room, which would create some difficulty for dramatic productions. 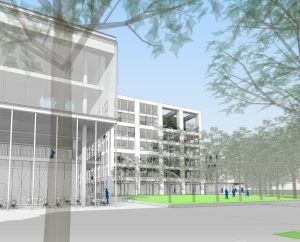 The redevelopment will include a Student Services Building, for student services. ANU has decided to address the understandable frustration with student services being scattered across the campus. No longer will students have to go to Marcus Clarke to get a student card, or talk about exchange in a marquee. 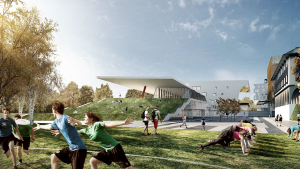 The Union Court recreation building, including a 25 metre six lane pool, a fifteen by eight metre hydro pool and a 24 hour gym will be constructed where the ANU Arts Centre presently stands. 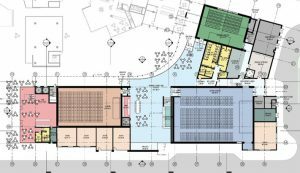 The Club Group, who operate gyms throughout the ACT and Wollongong as Club Lime, will be running the new recreation building. ANU Sport announced at their AGM earlier this month that they had lost the bid to operate the facility, claiming that ANU had sought a company able to run a more commercial operation. How much will fees be? We don’t know yet. ANU Sport currently charges students $524 for a 12 month memberships, and members of the public pay $699. Club Lime in Braddon, meanwhile, currently charges $832 for a 12 month membership. The Club Group have not yet set out the specifics of their future pricing plan, but Woroni has previously reported that prices will be “competitive” with current ANU Sport rates. ANU has confirmed that ANU Sport will continue running the sporting clubs. Concert venues by night, lecture theatres by day: that’s the plan for for the Culture and Events building’s large seated venues. All up, this provides 950 seats for lectures – a big step down from the 1405 in Manning Clarke. Here’s our two cents, from the conversations we’ve had: ANU doesn’t believe lectures have a big role in the future of university courses. These multi-purpose venues are a preparation for that; they can be used for a dozen things besides lectures, unlike the single-purpose Manning Clarke. However, ANU is also committed to allowing conveners to design their own courses, and the university is extremely reluctant to force lecturers off lectures. This is their compromise: a series of venues which can be used for lectures if conveners really want to, but aren’t built for it. Academics in CASS have expressed concern over the practicality and speed of retractable seating. However, Marnie Hughes-Warrington promised a “speedy” solution. Most new classrooms and learning spaces will be in the Collaborative Learning Environments Building. What the Schmidt is a Collaborative Learning Environments Building? Collaborative Learning Environments is a ridiculous name, so until ANU finds a prestigious academic or millionaire after whom to name it, we’re calling it the teaching building. 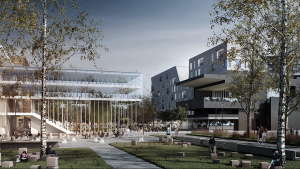 One of the flagship buildings of the new redevelopment, the teaching building will include “multi-purpose, multimodal, flexible learning spaces which will be embedded with new digital infrastructure”. To translate: there will be a bunch of classrooms with moveable walls, and informal teaching spaces, similar to the new CBE building. 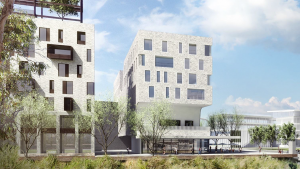 The building will be where the current BKSS and western half of the ANUSA offices stands. The 6 floors will include 920 seats, 60% for formal learning (classrooms), 40% for informal (study spaces). 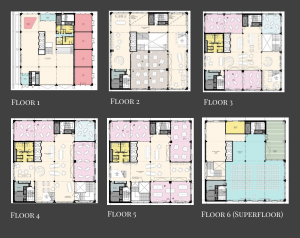 Spaces within the floors can be opened up and adjusted to fit events. The building includes a ‘superfloor’ on level 6 with 320 seats. There’s also one space for 120 people, seven spaces for 60 people, two spaces for 30 people, and flexible walls for multiple 30 people rooms. The stairwells between floors will all be like the CBE stairs, with nested seats and powerpoints. CBE steps are similar to those planned for the teaching building. The building is intended to take pressure off Chifley by allowing students a place to study informally. “There’s no evidence students don’t want to be [on campus], the interesting thing is they want to be in more informal spaces”, says Hughes-Warrington. The teaching building, ANU was chuffed to tell us, has a wood rather than steel frame. This means it won’t suffer the poor wifi which plagues older classrooms – there should be high quality wifi throughout the building. “I unashamedly want to make sure this [building] is accessible to students with disabilities”, says Hughes-Warrington. There will be large elevators in the building. If you drive, you’re in luck – the new Union Court will have a road running straight through the centre. This will grant cars full access to the Union Court area. The road will veer right off Kingsley street and slot in the unused space between CBE and PAP Moran. The next segment will run through where Manning Clarke now stands, plow straight through Union Court, and run in front of Chifley to finish up at Fellows Oval and the pool. There will be car access to the heart of Union Court, but also road cutting across one of ANU’s busiest thoroughfares. It’s as yet unclear how wide this road will be, and whether there will be explicit crossings, like most campus roads, or a share-way similar to Bunda street in Civic. The redevelopment will include an underground car park with 400 spaces. We’re told it will be “in close proximity” to the shops, services, gym and pool. These have been confirmed to be short-stay spots, probably administered on a Pay As You Go (PAYG) or surface parking permit basis. Parking on campus has long been contentious, and we expect this will be no different. With surface parking permits having risen from $191 in 2013 to $412 this year, prices can be expected to continue to rise. And as for competition for spots… imagine the conflict for a table in Chifley, except everyone’s in a 3 tonne vehicle. The carpark will be short-stay, presumably for students and employees within Union Court. ANU has expressed a desire that it be a “turnover carpark”, rather than all day parking. The graphic on the Reunion Court website shows a stunningly blue and clear Sullies Creek, with two canoes bobbing invitingly in the water. So ANU either has a multi-million dollar plan to clean up the entire Sullivan’s Creek catchment area, or they’re being a little ambitious.